Twenty-seven years ago, someone stole Billy Corgan's favorite guitar—an early '70s Fender Stratocaster with a DIY floral paint job—after a Smashing Pumpkins gig. Corgan says the Strat was fundamental to the group's early sound, as heard on their debut Gish. At the time, Corgan offered a $10,000 reward. In 2010, still longing for his beloved instrument, he upped it to $20,000. "The guitar made its way back to him via Beth James, a mother of three who doesn't play guitar and lives in Flushing, Michigan, about 80 minutes northwest of Detroit. She'd spotted the guitar at a Detroit yard sale and plonked down $200 for it because she thought it would be a cool conversation piece in her basement. 'I thought it was painted cool,' she says. 'I literally don't know anything about the guitar. I actually told my husband I only paid $100 for it because he would have killed me if he found out I paid more.' And there it stayed for the last 10 to 12 years." 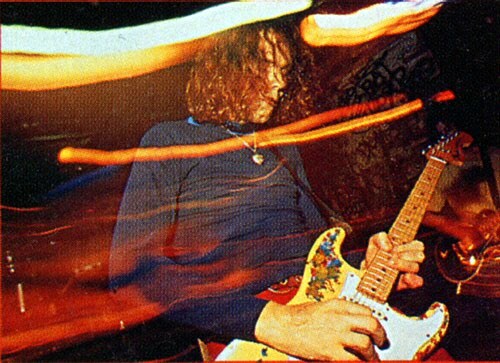 Corgan with his '70s Strat. It wasn't until James wanted to sell the Strat that a friend of hers noticed it might be Corgan's. After her first attempt at reaching Corgan didn't work, she was able to be connected through a friend's brother. Corgan, who in 2008 worked with Fender to create a signature Strat modeled after the stolen instrument, is elated to once again have it in his arsenal. "If you had told me 27 years ago that A) the guitar would come back to me some day and B) I would still be in a band with James and Jimmy, I wouldn't have believed you in either count," Corgan told Rolling Stone. "So I think it's cool we're still playing and that the guitar is going to be a part of the new record, and I think it's pretty cool that we're still rocking, to quote James." As for the $20,000 reward? Beth James turned it down. To see pictures of the reunion and hear more about the instrument, check out the Rolling Stone article here. And if you'd like to read more about famously stolen guitars, check out our "Still at Large: 6 Famous Stolen Guitars That Have Yet to be Recovered." Of course, in the 27 years since the theft of his Strat, Corgan has acquired plenty of other guitars. In 2017, he launched The Official Billy Corgan Reverb Shop, where he sold 118 pieces of gear from throughout the Smashing Pumpkins career. To see all the guitars, amps, and more Corgan sold through the site, you can see his Reverb Shop here.